When spring comes around, there are lots to get excited about. For some of us in the East Coast, the flowers are just starting to poke through the ground after a long cold rest. The birds are returning from their winter migration to prepare for a long stretch of early morning serenades. And of course, we get to find out what colors and trends are making noise in the world of home and fashion. What’s gathering all the buzz this spring is a warm and gorgeously inviting color called living coral–also known as Pantone’s color of the year. I for one think it’s earned it. With a rich, vibrant tone this shade feels bright, cheery and energizing without overstating or being cliché. There is a happy elegance about it that I find extremely inviting—and I’m obviously not alone. 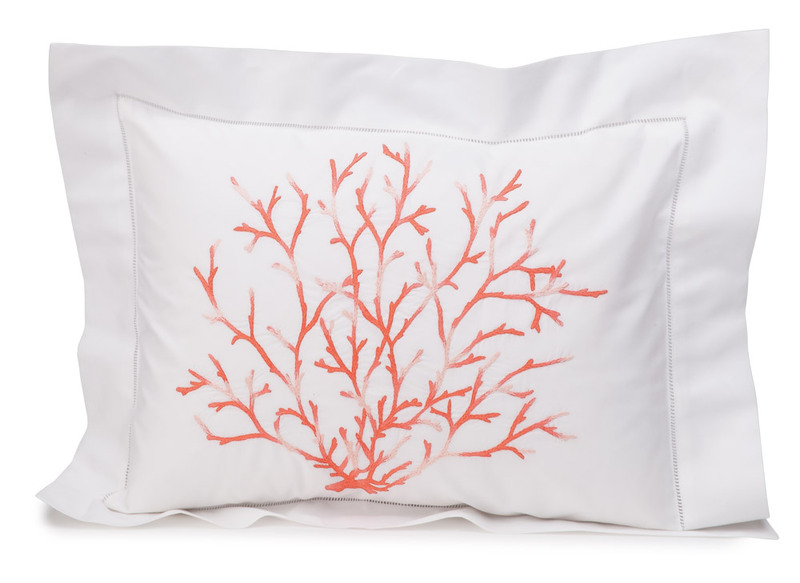 Living coral may be this year’s hottest color but the incredible impact coral designs and its color has on a room is nothing new to Schweitzer Linen. That’s because for almost five decades they’ve created hundreds and hundreds of unique industry-leading designs–many of those starring the enticing beauty of coral. 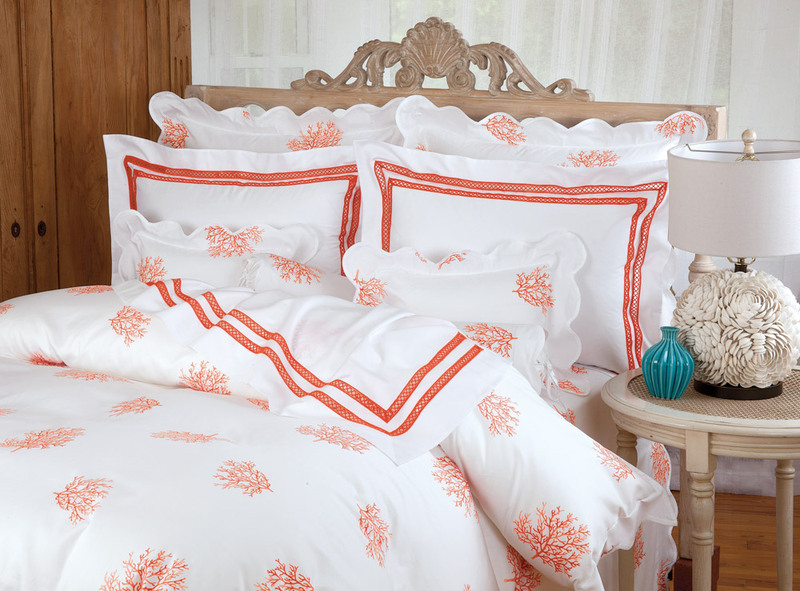 If you want to add coral’s bright optimism and rich reverence to the magnificence of life in it’s natural flow, check out these featured collections of fine bedding and clothing. In no time at all, you can refresh your decor and style with a coral design that embodies everything there is to love about this year’s most sought after color. And you can do it all for an extremely affordable price. A classic memento of treasured moments on a romantic isle brings the feeling home to you in this beautiful Coral print. Made in Italy of 300 thread count Egyptian cotton sateen. Classic beauty and elegance shine through every single thread of our lustrous 300 thread count Egyptian cotton sateen, superbly crafted in Italy. Intricate inserts of gigliuccio* lace give it a hand worked look. 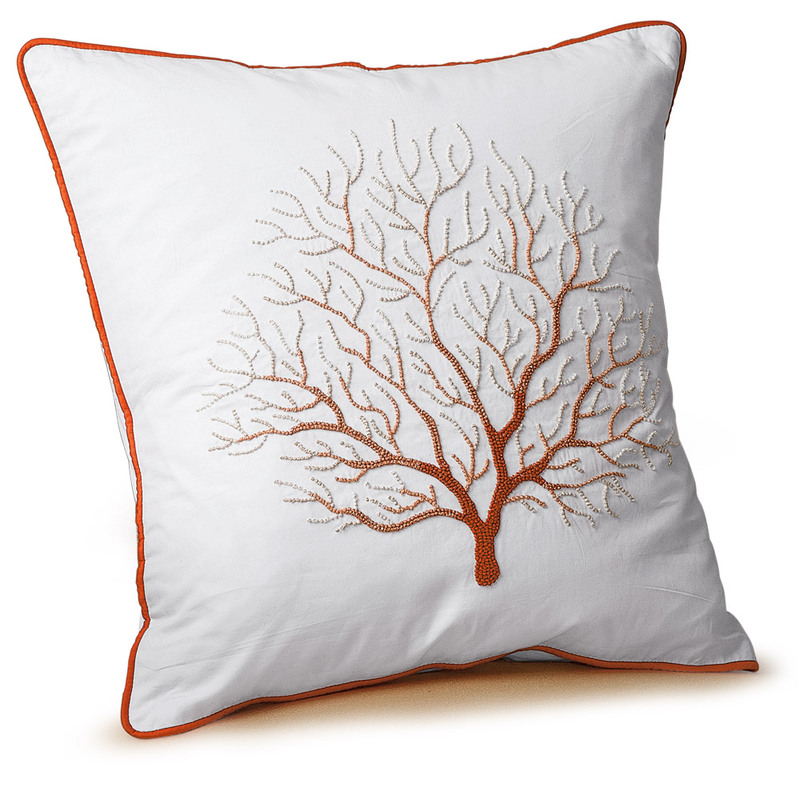 Inspired by the famed pointillist works of Georges Seurat, perfectly placed French knots in shades ranging from rich Orange to soft Peach to creamy White create an exquisite specimen of delicate Sea Fan coral. 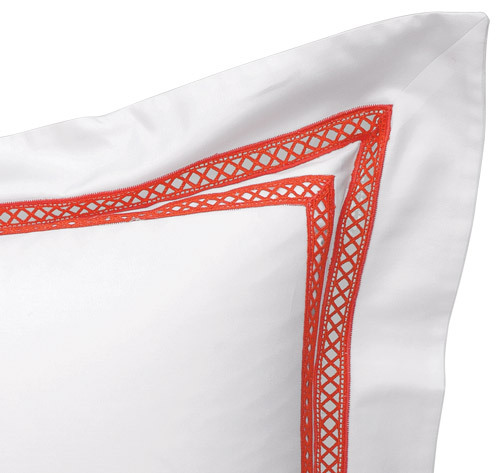 Hand embroidered with exceptional care on sumptuously smooth 600 thread count Italian cotton percale. Imported. 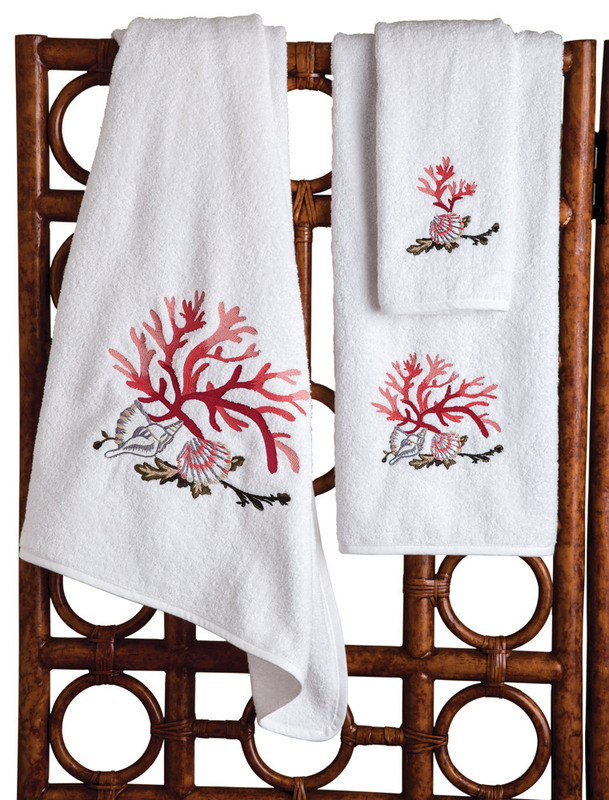 Embroidered coral and seashells bring nature’s wonders of the deep to the surface of lush, super absorbent cotton terry towels. Made in Turkey in all sizes for all of your baths and powder rooms. As romantic as falling in love beside a tropic ocean, this incandescent ensemble is ready to ignite that passion wherever you may be. 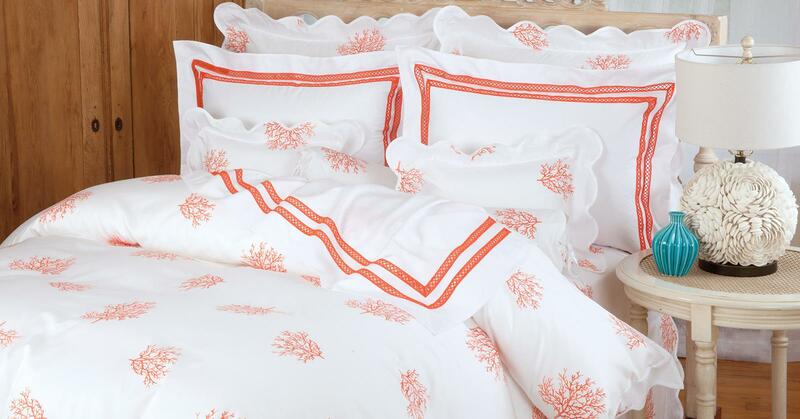 With delicate specimens of Coral printed on shimmering White pure silk charmeuse.